Living in her forever, loving home. This face says it all. This is our little pony girl, Harley. Harley’s past is uncertain. We know it involved an auction, lack of food and water, no proper health and hoof care, living outside in all elements – without shelter, physical threats such as guns, and human contact that was inconsistent and rough. We know her past filled her with fear. Harley came to live with us in October, 2016. In the time she has been with us, she has adjusted well to our sanctuary and the care she now receives. This girl, who is approximately twelve years old, has not given up, despite the horrific experiences we are sure she faced before arriving at our gate. 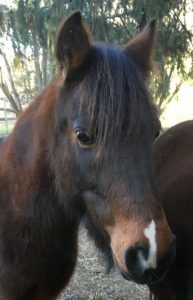 Harley longs for connections with both humans and other horses. She is so very willing. She is willing to trust, to learn, to give and receive love, and to lead a full life. It is our job to find her a forever home and get her ready for that forever, full life. Can we count on you to help? Information recently uncovered indicates that Harley was trained to drive and can be ridden. She will need a mature, patient individual to make her feel safe and loved, so that her knowledge can once again show through. Are you that person? We hope all of you will join with us and celebrate this girl. 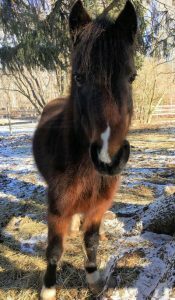 We need donations to ensure we can provide Harley with everything a young girl needs to grow into a healthy and happy adult pony. 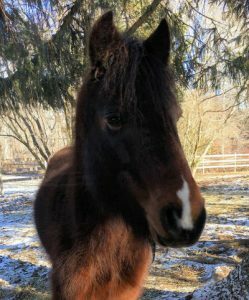 We need assistance in seeking a forever home; a home where she will be able to remain throughout the rest of her life – in peace, always protected.